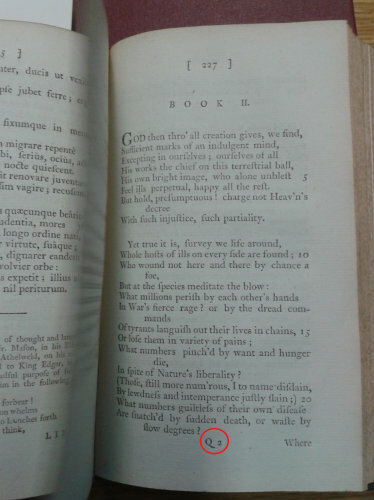 Most of authors define signature as a figure, a number or a small capital letter placed by the compositor at the foot of the first page of every section of a book. It is placed below the text in the direction line of its first recto (right hand-page) and often repeated in sequence on further rectos. It might be considered a first form of pagination. Signatures were first printed on books not for the readers but for people whose work was folding them. Books indeed were not printed leaf by leaf but on large sheets of paper containing a number of pages on each side, in a second moment these pages were folded up to make groups of leaves. The book binder had to fold up these leaves in the right order and in the right way up. For this reason each sheet was signed on the first page so that they could be arranged in alphabetical order. This sequence of symbols had three main functions (Glaister 445): to help the compositor, the warehouseman and the machine binding operator in their work of folding sheets and putting sections in the correct way. Letters used as signature marks are from the Latin alphabet; these are twenty-three and do not include I, J, U or V because they were just variations of two already existent letters and there was no W too. This custom was derived from manuscripts and incunabula (which were books printed before 1501). Signatures are always printed in roman type in order not to be confused (Glaister 445). During the nineteenth century signing of English books was still made most of the times with the traditional twenty-three letters of Latin alphabet; small capitals were more common than large, and there was the tendency to remove all signatures after the first of each gathering. Another tendency was spreading around England: the use of Arabic figures as signature rather than letters, which was not very successful. Figures for signatures became more common from the 1820s but didn’t become the most popular of the century (Gaskell 196). On each large piece of paper was written a letter of the alphabet. 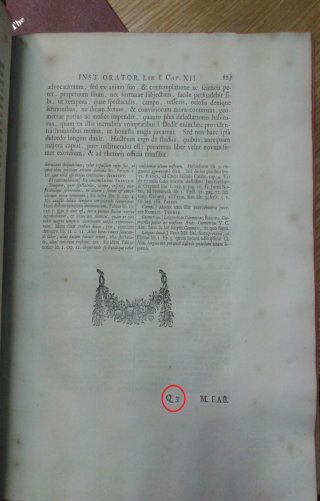 The first impression for a quarto book labelled A, and on every individual leaf part of this paper were printed A1, A2, A3, A4 (Fig.2). 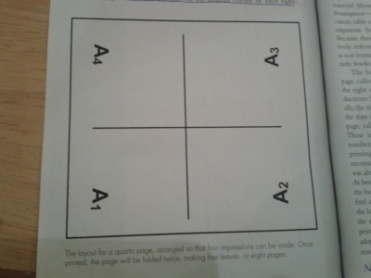 On every new paper there was a different letter. 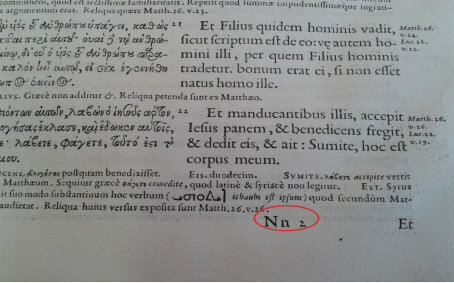 For example the first ‘gathering’ for a quarto book would be A1-A4, the second B1-B4, and so on. 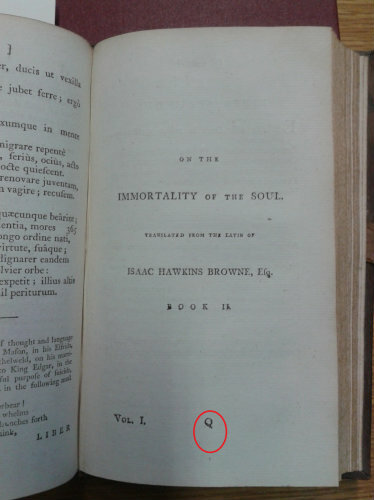 In an octavo signatures would be from A1-A8 (Howard). The twenty-fourth sheet was signed Aa, the forty-seventh Aaa and so on. (It was usually for duplicated signature-letters to be set out in full, but English printers in the eighteenth century preferred to set 3A for Aaa, 6A for Aaaaaa, etc.) Signatures after the first of each sheet were distinguished by numerical suffixes (for example: the second signed recto of sheet Aa was signed Aa2) (Fig.3). The main signature series usually begins at the start of the text of a book, but before this starts there are some other gatherings or leaves, such as the title page, dedication, preface. 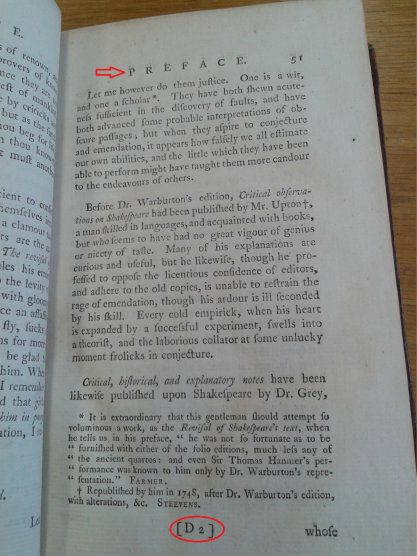 In any case we should say that sometimes old books began the signature at the beginning of these additional leaves called preliminaries) (Fig.4). According to several sources there were different forms of signature depending on the period and on the place: for example in England they used to begin the main signature with B, rather than A, because they signed the sheet of preliminaries with A. The signing of the preliminaries sheet was more various. English printers that started the main signature with B, usual assigned A a b c to the preliminaries or used symbols without logical order. During the fifteenth and sixteenth century printers added (with some problematic results) a summary of signatures called the register. The use of signatures in manuscript books was not so uniform as it became in printed books, but anyway it was replaced in the sixteenth century by page numbers, which later led to the introduction of an index. It’s important to say that the term signature is not synonymous with sheet or sections. Sheets were paper that may contain several signatures and sections were a binder’s unit (Arvin).